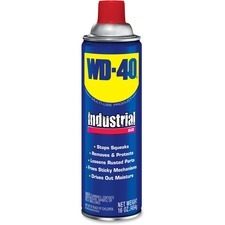 WD-40 features a multipurpose formula to provide thousands of uses throughout your home or office. Moisture-displacing design quickly dries out electrical systems to eliminate moisture-induced short circuits. Corrosion-resistant ingredients shield and protect metal surfaces against moisture and other corrosive elements. Plus, its advanced design loosens rust-to-metal bonds and frees stuck, frozen or rusted metal parts.